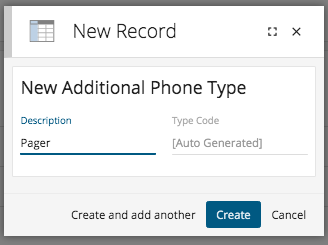 This article outlines how to configure additional phone number types within the CRM. We understand that the standard Phone Number & Mobile Number field may not be enough to record all possible contact numbers. Therefore, within the Communication page on a contact record you can add in additional phone numbers. When adding an additional phone number you need to select a phone number type, which can help when reporting on contact numbers. To configure your Additional Phone Number Types you will require Prospect 365 Administrator rights, if you require these then please speak to your key CRM user or our Customer Services Team. To edit your Additional Phone Number Types, click on the settings icon in the bottom left-hand corner. Once within the Settings Centre, navigate to the People & Places section & scroll down until you reach the Additional phone number types configure option. By selecting the 'Click to Configure' link the Configure Additional Phone Types window will open. Within this window all of your current Additional Phone Types will be listed. To add a new one click on the + icon in the top right-hand corner. You will then be able to give your new Additional Phone Type a description which will appear to all CRM users. For example you may wish to add a phone type of Pager if you work within the Medical Industry. Once happy with the information entered click Create & your new Additional Phone Type will be available.